By Allan Fox: Adrien Broner won’t even consider for a second the possibility of him losing to WBA ‘secondary’ welterweight champion Manny Pacquiao this Saturday night on SHOWTIME PPV at the MGM Grand in Las Vegas, Nevada. Broner (33-3-1, 24 KOs) has studied his prey carefully, seeing weaknesses in the 40-year-old Pacquiao’s game that were exposed by Floyd Mayweather Jr., Jeff Horn, Juan Manuel Marquez and Jessie Vargas. Broner, 29, intends on taking full advantage of every flaw in the former 8 division world champion Pacquiao’s game this Saturday night. 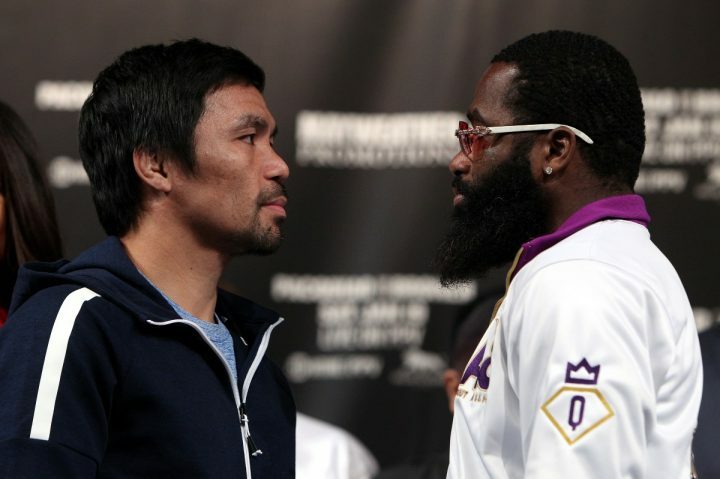 Broner wants to thrash Pacquiao on Saturday night. Afterwards, there won’t be any hard feelings on Broner’s part. He says that after he beats Pacquiao, he’ll party with him in Las Vegas. Whether Pacquiao will be in the right frame of mind to accommodate the Cincinnati native in that endeavor is unclear. If Pacquiao loses to Broner on Saturday, the last thing he’ll want to do is celebrate the loss by going out on the town and having drinks. The problem with Pacquiao losing to Broner is the way the loss would be perceived by the boxing public. Pacquiao getting beaten by an elite level welterweight like Errol Spence Jr., Terence Crawford, Keith Thurman or Shawn Porter wouldn’t be seen nearly as bad as getting beaten by Broner, who has already been exposed as not having enough talent to beat the top fighters at 147. Even though Pacquiao is passed his best years at age 40, he’s still popular enough and has enough left in his game for Broner to receive a massive amount of credit if he beats him on Saturday night. Broner may not want to admit it, but everything hinges on the outcome of this fight. This is a crossroads fight for ‘The Problem’ Broner, who cannot affor to absorb another defeat. A loss to Pacquiao, especially a bad one, furthers the belief that Broner is a faded fighter that has nothing left in the tank. It bothers Broner that Pacquiao is saying that he wants to knock him out. Pacquiao didn’t used to tell the boxing fans that he wants to KO his opponents. It’s only recently that Pacquiao is saying that he wants to get a knockout. Pacquiao noticed all the attention that he received with his 7th round KO victory over Lucas Matthysse last summer on July 15, so he wants to continue to stop his opponents, because it’s good for his career and it pleases the boxing public. Pacquiao wasn’t knocking anyone out from 2010 to 2017. That was a long gap where Pacquiao was unable to score a knockout. This fight can be a real war if Broner is willing to let his hands go. That’s the type of fight that Pacquiao wants, as that’s the kind of match that he’s thrived on his entire career. Broner is incredibly lazy in his fights, it makes you wonder if he’s capable of fighting hard. Broner has to be willing to gas out for him to have a shot at unseating Pacquiao, and it’s not likely that he’s going to be willing to put himself in the position where he’ll run out of gas. If Broner was in his early 20s, then maybe he would, but that was before he became wealthy and satisfied. Success ruins fighters, and it’s clearly robbed Broner of his game. Broner’s best chance of beating Pacquiao is to knock him out. He’s probably not going to be able to out-box Pacquiao. Broner lacks the hand speed and the work rate to outwork Pacquiao. If both guys are throwing the same amount of punches, you have to believe that the judges will give Pacquiao the decision win. It’s not too likely that Broner will be able to match Pacquiao’s high work rate. Broner is still more of a one punch at a time thrower rather than a guy that puts his punches together in combination form. To get the win over the highly popular Pacquiao, Broner will need to throw a lot more punches on Saturday than what we saw from him in his recent fights against Jessie Vargas, Mikey Garcia and Adrian Granados. Broner looked lazy in those fights, seemingly saving his energy until the later rounds of the contest for fear of running out of gas. That’s a strategy that failed to work, as Broner lost a lot of rounds in those three fights. Granados was arguably robbed of a victory against Broner. All three of those fights showed that Broner has concerns with his stamina, and for that reason, he’s not letting his hands go in the first six rounds of his fights. If he uses that same approach in his fight against Manny this Saturday, he’ll fall behind and lose a 12 round decision, if he doesn’t get knocked out. Pacquiao does well against fighters that don’t let their hands go like Broner.